Wednesday brought a second winter snow to Chapel Hill and this time there was no messing around with a couple of inches. The garden was graced with spectacular 9.5 inches of snow. By Sunday the snow was nearly gone and the day was a pleasant 67°F. Snowy Beauty – On Thursday the sun returned. The starting point for today’s vase was a piece from a large, broken branch of crape myrtle, a 3-inch circumference victim of the heavy snow. The crape myrtle wood is red and smooth and after the stark white snow it seemed especially appealing. 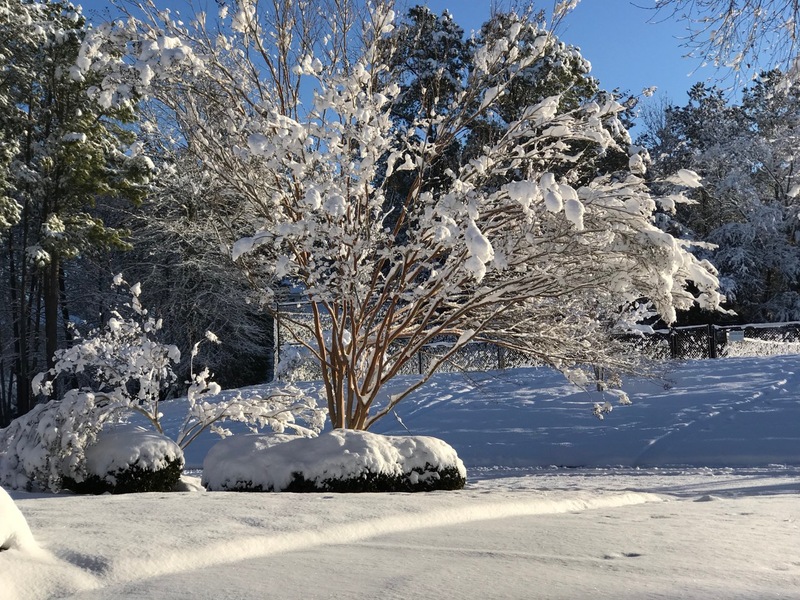 Crape Myrtles suffered damage from heavy snow. I decided to sacrifice a stem from a salmon-colored phalaenopsis to set off the polished red bark. Unfortunately the portion of the crape myrtle branch that prompted this choice, the part that was interesting and colorful, was also much too thick and heavy for me to use. I ended up with a couple of branch tips that serve valiantly but lack the innate beauty of the red bark. Still I like the richness of the flowers against the gray stems. And outdoors in the garden, tucked deep within cold-touched gardenia shrubs, I found several sets of lush green leaves to fill out the design. 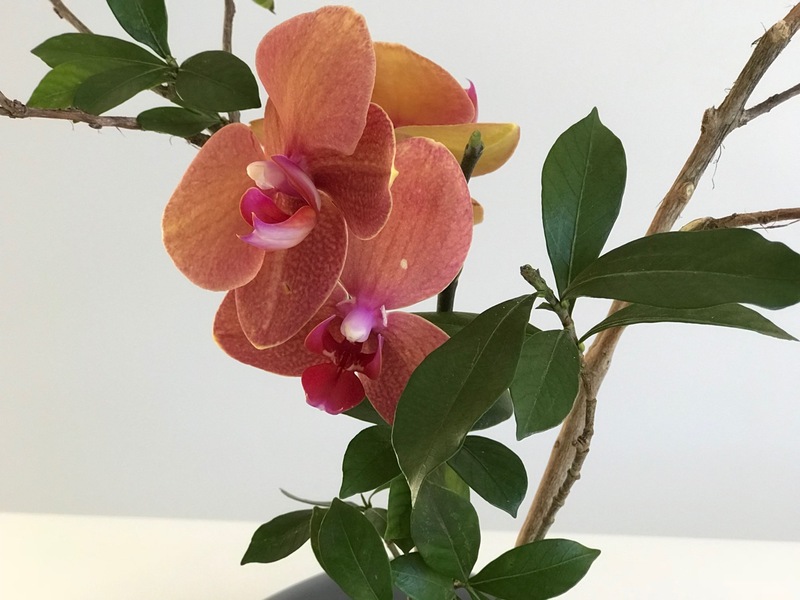 This entry was posted in garden and tagged 2018vase, flower arranging, flower design, in a vase on monday, nature photography, Phalaenopsis, snow, winter garden on January 22, 2018 by pbmgarden. You have a style that is unmistakably your own Susie and I love it! Thanks Christina. Preparing Monday vases has given me a chance to try a lot of styles but I do seem to gravitate toward this form. Feels the most natural. and you’re very talented at doing it. 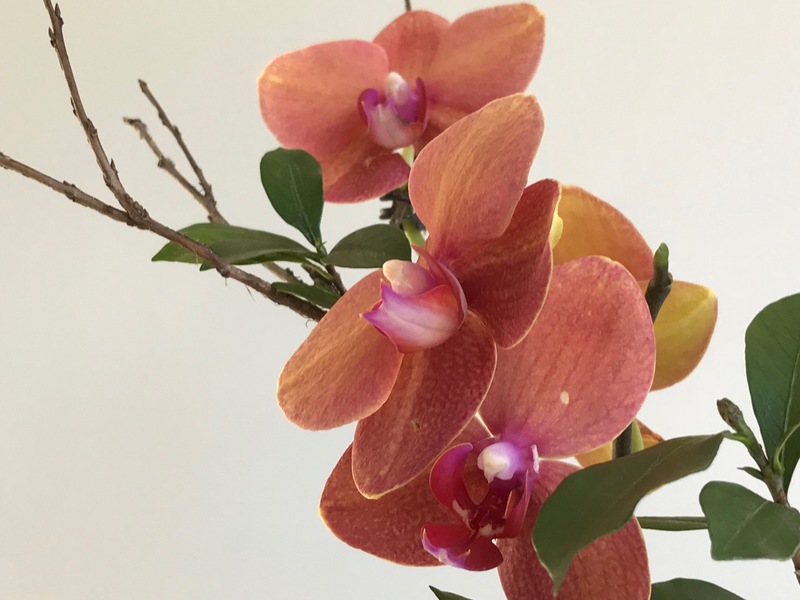 Your moth orchid is quite beautiful with those delicate salmon pink tones! It is a winsome color, isn’t it. There are quite a lot of variations within the petals. There is such peace and solace in your vase….the form and choice of material has me breathing slow and really taking time to take it in….I especially love the color of that flower. Glad you found these qualities here today Donna. 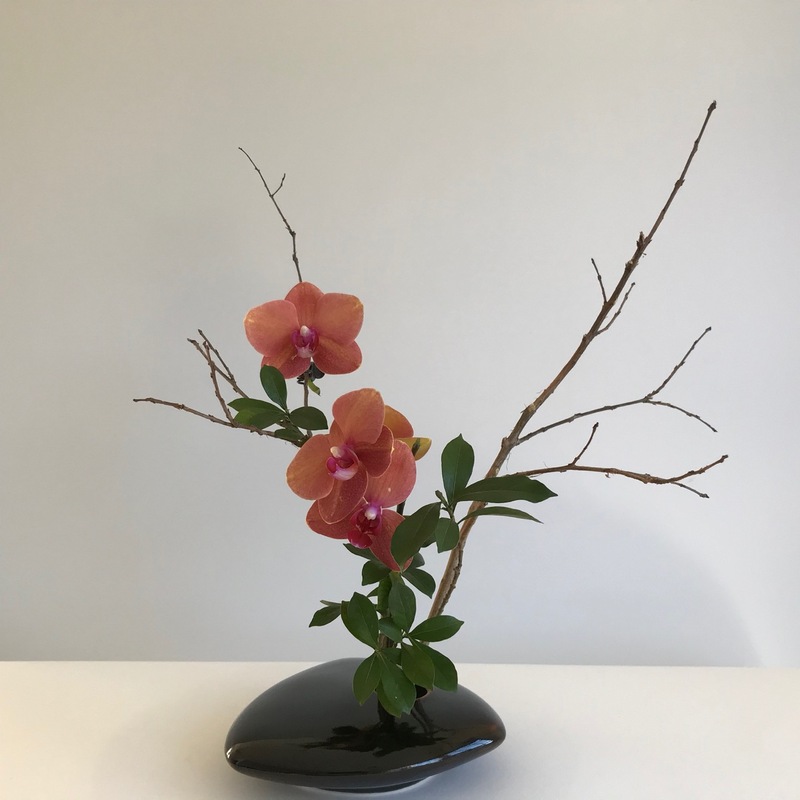 I’ve seen several Ikebana demonstrations and the process itself is meditative–one of the things I like about it. A very worthwhile orchid sacrifice. Lovely lines again. Is that as much snow as you have ever had? Thank you. There’s still one flowering stem left on the orchid plant to enjoy as well. Yes, this is the most snow I’ve seen in my life, previously 8 inches was the record for me. I have never seen that much snow! Thank you. Hope the Lagerstroemia doesn’t decide it wants to be in other arrangements Annette! Very well done! The style and snowy story behind this arrangement make it even more special. Gorgeous! Thanks Peter. The snow was highly irregular for our area. 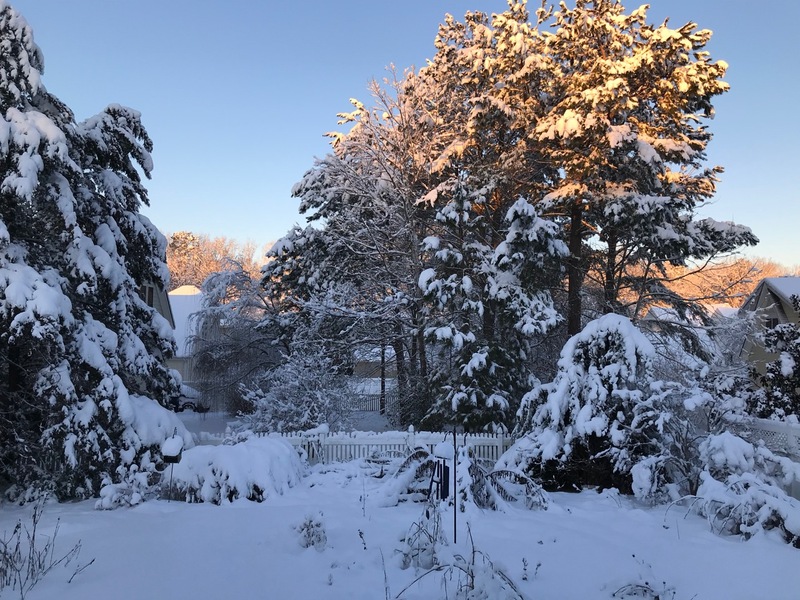 9.5″ of snow to 67 degrees in just a few days – gosh, that IS a contrast! What a shame the crape myrtle was too chunky to show off its red bark in the vase – you couldn’t have used it as a prop in any way, could you? 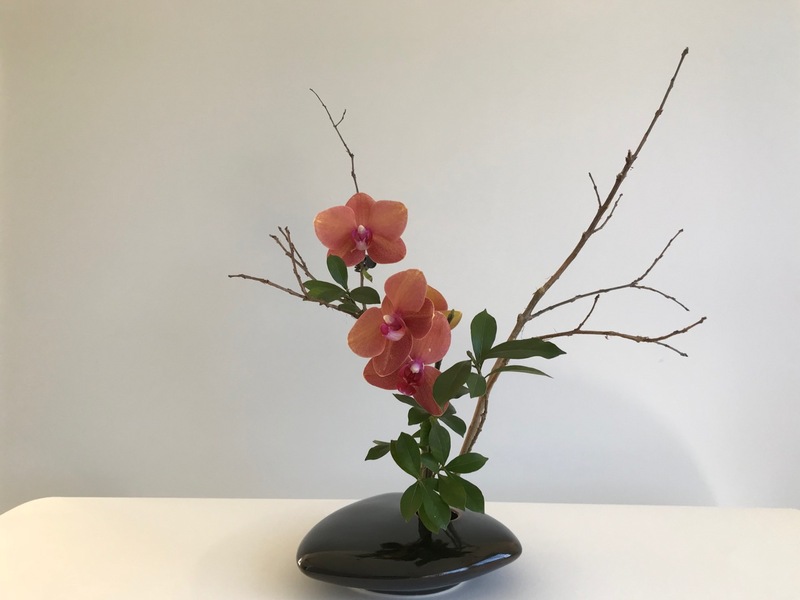 The tips, though, set off the orchid beautifully and the greenery looks perfectly placed – were you pleased with the overall effect yourself, Susie? It would have been nice to highlight the crape myrtle but I ran out of time trying to figure out a way to make it work. I did like the way the arrangement turned out overall. Have a good week Cathy. What is the weather doing now, Susie- what sort of a week do you think you are in for? We’re having a rainy day, which should clear the final pockets of snow. It’s 63 degrees F. and should be sunny the rest of the week. I’m itching to get outside in the garden a bit but have some traveling to do today to see my sisters. They both have January birthdays and we will celebrate. Your get together will be nice to look forward to. We had fun. Something special about sisters. It’s a beautiful arrangement, Susie, even if it didn’t meet your original specs. I love the orchid’s warm color. Almost 10 inches of snow sounds both exciting and intimidating. I hope you don’t have to get outside with a snow shovel! The orchid has made me happy this week. The snow is mostly gone and will be now that we’re having rain. My brother-in-law was visiting during the snow and insisted on shoveling (and no, I don’t own a snow shovel). He is originally from Wisconsin so it seemed necessary to him and was helpful of course. Thanks Cathy. Yes, the snow was so unusual in texture and quantity–a nice winter treat. That’s the kind of snowstorm to have: here today, gone tomorrow. Your arrangement lives up to the high standard we have come to expect from you. Thanks for the vote of confidence Ricki! You’re right about the snow–it’s great for a day, okay two days–then I’m ready for it to clear. This one was especially lovely. Beautiful vase but what a nightmare to get that much snow! Yikes. Heavy snow on trees and plants that have leaves on is so damaging because they hold all that heavy snow. Looks beautiful though. We are way below normal snowfall and haven’t had much more than about 4 inches or so at one time. Currently raining and the little snow cover we had is just about gone. Thanks Linda. The snow was really nice overall (despite the tree damage). It was lovely, we could stay safely home and enjoy it without worrying about travel, and then it left quickly. Very pretty design, Susie. A pity about your crepe myrtle. It’s amazing that 9+ inches melted in a few days. That was quite the storm! Thanks Eliza. The crape myrtles each suffered some damage (not the first time for them unfortunately). We enjoyed seeing the large snowfall but the warm days following with temps in the 60s suits me much better. Best of both worlds. Gorgeous, gorgeous snow images…and the vase, too! You’re getting more snow than we are (in S. Wisconsin) this winter so far. Although it’s snowing right now, so we’ll see how much we have by the morning. There’s something special about a fresh snowfall. Enjoy you newly fallen snow Beth. Ours was lovely but I wasn’t sad to see it disappear quickly. Oh my, I do not think I would have been willing to part with those orchid flowers. I would have left them attached to the plant that they were blooming on. 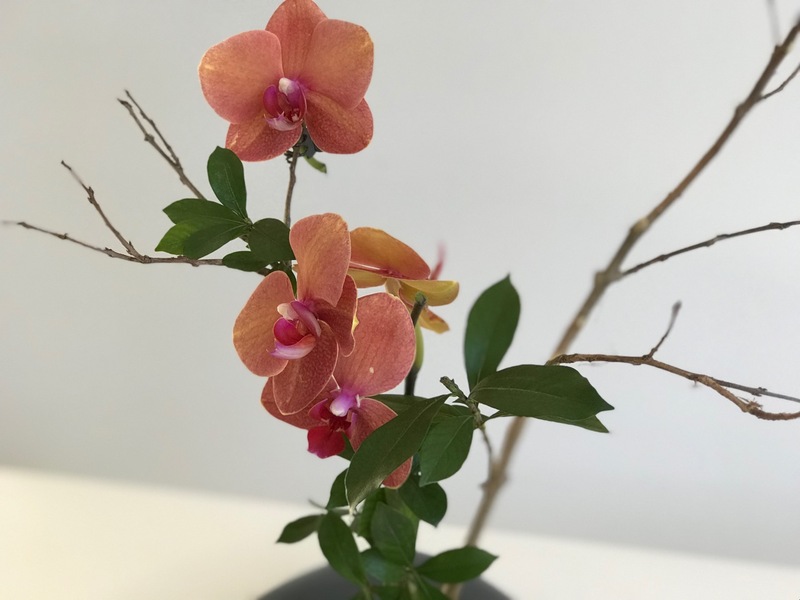 Hi Tony, fortunately the orchid had two flowering stems so I was able to remove the smaller for the vase and still enjoy the larger one on the plant itself. My favourite style – a beautiful vase. It’s a lovely arrangement as you always do. I’m so glad that the 9.5″ snow was gone so fast because I’m rooting for the plants in your garden, especially gardenias and ginger lilies. The gardenia leaves look a little burned but seems ok. Ginger lily is hit or miss every year. This phalaenopsis it pretty, i’ve never seen this kind before. Thanks. I don’t know much about orchids but I love them in arrangements. Alison, I’m never sure if my comments go through but your vase is very sweet and cheerful this week. How graceful. I have lots of phalaenopsis on my windowsill, I never thought of cutting them for arrangements, it looks so expensive and elegant. We had snow on sunday too but now we are back to rain. I am sick of cold and wet . Thank you. The phalaenopsis once cut will last about 5 days I think, so not as enduring as keeping the flower on the plant. Hope you get some nice sunny weather soon. I love the color of that orchid! The snowy shots are gorgeous! We got enough to look pretty but nowhere near 9 inches. The snow was amazing but I’m kind of glad today is bringing rain. Very restful. Too bad you couldn’t fit the crape myrtle wood, but maybe it can show up at a later date! I saved a piece of the crape myrtle for another time. It’s really lovely wood.